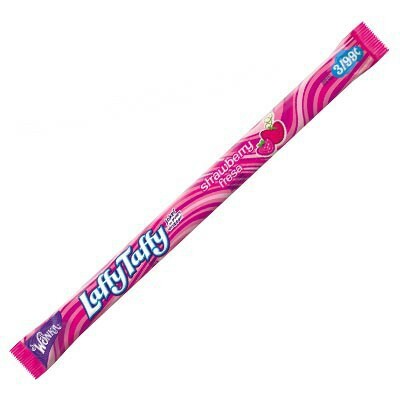 If it's not LAFFY TAFFY, it's not taffy! 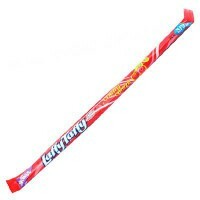 The incredible, long-lasting chew is one of America's most important contributions to the world of candy. 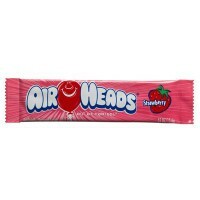 Many an allowance was spend on this strawberry-flavored sweet treat! Corn syrup, sugar, palm oil, less than 2% of: acidity regulator E296, emulsifiers E471-E322 (soy lecithin), hydrogenated cottonseed oil, salt, natural flavor, color E129*. *May have an adverse effect on activity and attention in children. Contains GMO. Nutrition facts (for 100g): calories 349Kcal, total fat 6.6g (saturated fat 4.4g), total carbohydrate 78.6g (sugar 48g), protein 0g, salt 0.4g.